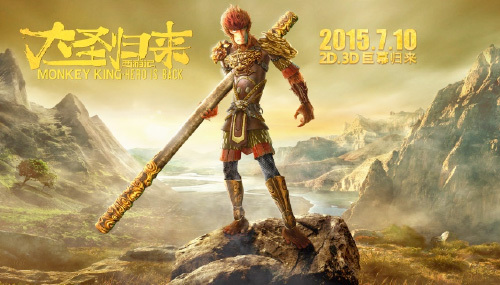 This summer, a new animation featuring Sun Wukong, the Monkey King, as the main character, became a huge hit in China. The Chinese 3D animated film called Monkey King: Hero is Back was released on July 10 and in just over three weeks grossed some 800 million yuan (approximately 16 billion yen*), breaking the records for box office profits for an animated film in China. The movie is still showing in theatres, so ultimately it is projected to gross more than 1 billion yuan, generating huge media buzz. Critics claim that this single movie has restored the confidence of the Chinese animation industry, which had been in stagnation for quite some time. Will Monkey King: Hero is Back trigger a renaissance for Chinese animation? Created over a period of eight years, the animation tells the story of Sun Wukong, the Monkey King. After being imprisoned within an ice cage deep in the Marble Mountains for 500 years, he returns as a true hero. In a way, the movie appears to be a vivid self-portrait of the rise and fall of Chinese animation. The question is whether this one work will be able to trigger a renaissance in the world of animation creation in mainland China. Although the film is titled Monkey King: Hero is Back, essentially it should be viewed as the emergence of an entirely new Monkey King, a character without precedent in the world of animation. He is a tall, powerfully built creature clad in leather armor, with the long thin face of a monkey. An embodiment of modern nihilism, the Monkey King's face is utterly expressionless, and the only emotions he strongly feels are frustration and defiance. His magical Gold-banded Cudgel is so huge that it is visibly unwieldy (Fig. 1). This Monkey King is also completely different from the various existing visual images of Sun Wukong. The plot of the movie, too, is quite original. Imprisoned deep within the Marble Mountains, the Monkey King meets an innocent child who releases him from his curse. This child will later become the famous Chinese Buddhist monk Xuanzang. With the help of this special child, the Monkey King fights with the evil monsters that attack his village. This turn of events, in which the middle-aged Monkey King forms an alliance with the seven-year-old Xuanzang, would have once been almost unimaginable and is far removed from the original story of Journey to the West. The first Chinese animated film, which features the Monkey King, is Princess Iron Fan created by the brothers Wan Guchan and Wan Laiming. It was made in the midst of the Second Sino-Japanese War and released on the eve of the outbreak of the Pacific War in November 1941. This work, which marks the beginning of Chinese animated feature films, was inspired by Disney animation, so like Mickey Mouse, the Monkey King wears gloves and has four fingers on each hand (Fig. 2). He rides on his Flying Nimbus, but fails in all attempts to borrow the magic fan made of banana leaves - a depiction quite unlike that of the typical super hero. Today, 70 years after the end of the Second World War, the Monkey King is reborn as a three-dimensional super hero. Much can be read into the significant change and the large gap between the two characters. There is one common trait in both movies, however. Both Monkey King: Hero is Back today and Princess Iron Fan 70 years ago were created with an awareness of U.S. animation. Tian Xiao Peng, the director of Monkey King: Hero is Back, has worked as the animation director of the Spiderman game, and the dynamic movement and sense of speed of the camera work in Monkey King: Hero is Back, and the portrayal of the characters in the action scenes all bear the imprint of U.S. movies, animation, and games. Of course, there are also many traces of things learned from Japanese animated films, particularly in the creation of the characters. This influence is visible in characters that evoke, for instance, the ancient stone giant Moog from The Great Adventure of Horus, Prince of the Sun; the kodama spirits from Princess Mononoke; and the white dragon and No-Face from Spirited Away. It is a well-known fact that Princess Iron Fan, which was directed by the Wan brothers, influenced Osamu Tezuka's manga and animation work. 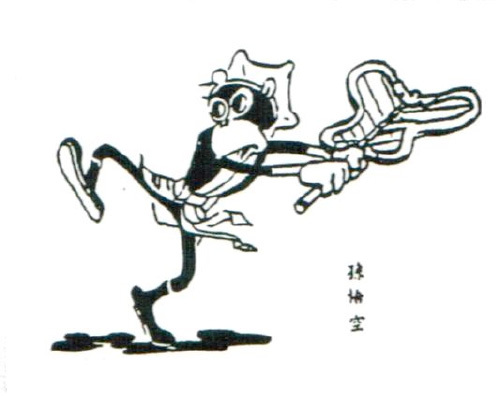 Tezuka's first job as an animator was to edit his manga Son-goku the Monkey into an animated feature film as the original draft of Alakazam the Great, a 1960 animated film produced by Toei Animation. Also, in one of his posthumous works The Tale of Osamu Tezuka: I'm Son-goku, broadcast as a special anime in the NTV 24-Hour Television, the artist recreates his impressions from watching Princess Iron Fan during the war and the encounter with Wan Laiming in China. The film Alakazam the Great, which is based on Tezuka's original draft, is an important work in the line of animated films featuring the Monkey King as the main character. Throughout the many films, his image is constantly reinvented and enriched, sometimes quite dramatically. Some films portray him as a mischievous yet naive character, others follow his development into a true hero, and yet other films feature his love interest, adding romantic elements to the image of the Monkey King. As for Osamu Tezuka, in his manga and anime works, he depicted the Monkey King as young as he possibly could. One extreme example is the 1967 TV anime Goku no Daiboken (Goku's Great Adventures) created by Tezuka's animation studio Mushi Production, which portrays the Monkey King as a cute, little child. It was Osamu Tezuka who depicted the Monkey King as a kawaii character. The image of the young Xuanzang in Monkey King: Hero is Back is perhaps influenced by the Japanese kawaii culture. Another 1960s film featuring the Monkey King, apart from the animated film Alakazam the Great produced by Toei Animation, is Havoc in Heaven. It was produced by the Shanghai Animation Film Studio and directed by Wan Laiming. The film is recognized as one of the greatest masterpieces of the new Chinese feature animation. Against the historical backdrop of the Cold War, the creators adopted various ingenious approaches in order to bring forth ethnic elements that would highlight the departure from Disney animation and establish the studio as a representative of the Chinese school of animation. The rebellious character of the Monkey King can be interpreted as a reflection of the spirit of the times in new China. The face of the Monkey King is covered with the makeup used in Peking Opera, and the combination of a yellow hat and jacket and bright-red trousers draws associations with the colors of the glazed tiles and walls of the Forbidden City. The animation features accompaniments and sound effects that are typical of Peking Opera, as well as music performed with folk instruments. Part One of the film was released in 1961, but Part Two, which was completed in 1964, was shelved due to the influence of the Cultural Revolution, and a full version of the movie was not released until 1978. I saw Havoc in Heaven as an elementary school student, but I still have very vivid impressions from it. For me it was the ultimate experience in animation films. From the early 21st century, China turned a deaf ear on the flourishing animation culture in Japan and the U.S., and Chinese animation followed a course of decline, but Havoc in Heaven is remembered by countless anime fans as a work of great historic pride. This memory inspired the 2012 release of the film in a 3D digitally remastered format. 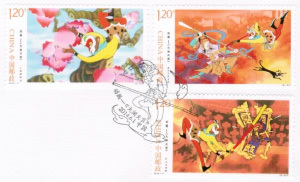 In 2014, China Post issued commemorative stamps of Havoc in Heaven (Fig. 3). These developments signify the increased cultural demand to revive the Monkey King as an animated hero. Despite its huge commercial success in the box office, Monkey King: Hero is Back is mostly notable for the enthusiasm with which it brings back the super hero and the impressive power of CG-generated images. The plot of the film clearly lacks sophistication and depth. More than anything, many of those who watched the film were likely disturbed by the portrayal of ghastly and irrational monsters that look like creatures from another world and are little more than clichés taken from U.S. science fiction movies. Journey to the West is a story that depicts encounters with various "other beings" (the supernatural). The question of how to portray such "other beings" is inextricably linked with the depiction of the "self" of the super hero. Even though the "self" is presented as a powerful character, the "other beings" are not depicted as something that can be understood. From my perspective, this is one of the shortcomings of the film. While I am certain that Monkey King: Hero is Back will be remembered as a great movie in the history of Chinese animation, it perhaps exposes the confusion and sense of turmoil at the roots of China's modern popular culture. 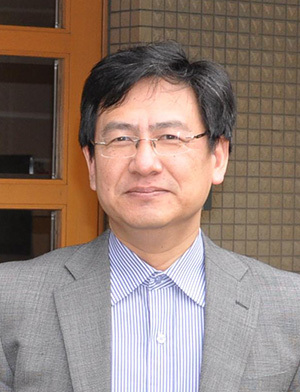 Born in Changchun, China, Qin Gang is Professor at the Beijing Center for Japanese Studies, Beijing Foreign Studies University, and a member of the board of the International Society for Akutagawa Ryunosuke Studies. He completed a doctoral course at the University of Tokyo and obtained his PhD in 1999. He specializes in Japanese contemporary literature, comparative research of Chinese and Japanese literature, and Japanese popular culture.